“There’s a reason that each autistic person has embraced a particular interest. The quote above highlights the cruciality of connecting with, celebrating and capitalising on the unique affinities of autistic individuals. 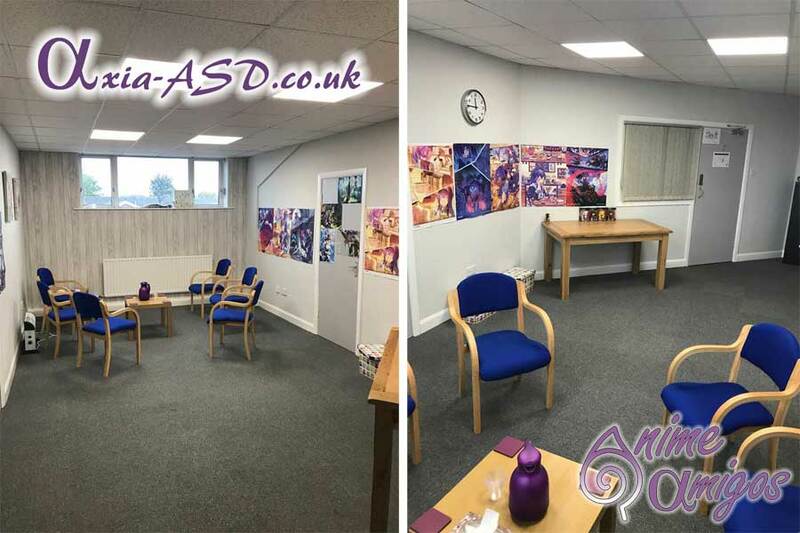 A commitment to this way of thinking and working with autistic people underpins the assessment, diagnostic, and post-diagnostic work at Chester-based neurodevelopmental service, Axia-ASD Ltd. Partnership and shared expertise with those who use the service are amongst Axia’s underlying values. The service adopts the view that neuro-diverse individuals are amongst the most creative, talented, interesting and inspiring members of our society – developing and nurturing their affinities is vital. 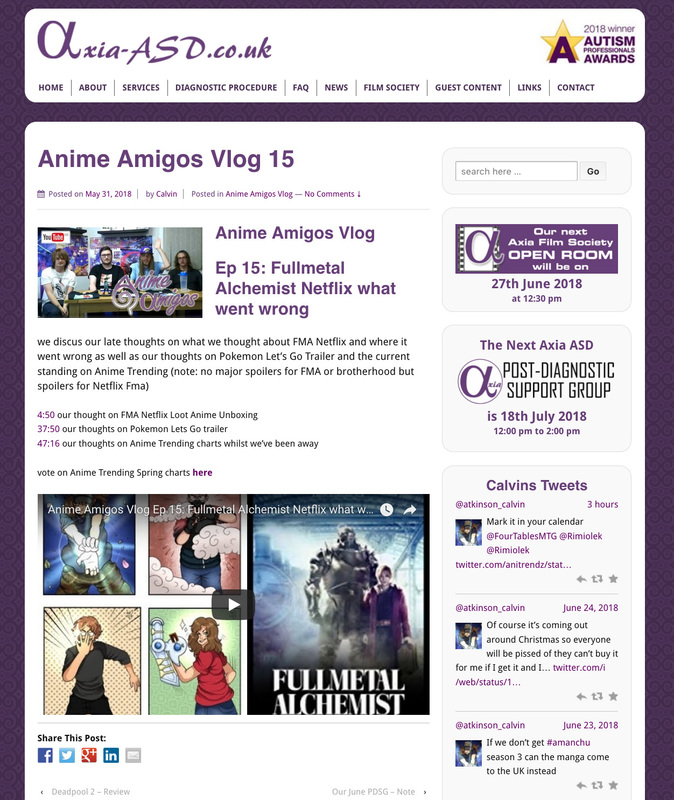 This article describes an example of creativity, partnership and celebrating interests at Axia-ASD Ltd. That is, the work of Anime Amigos. 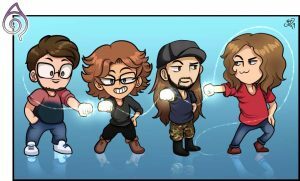 Who are the Anime Amigos? In recent years, members of the staff team at Axia realised that they shared a deep passion for one art form with autistic individuals accessing the service. Anime is a medium which combines comic-style images, intense colour and movement with captivating fantasy storylines, for TV and film. Through conversations centred on a shared interest in Anime at Axia’s post-diagnostic support group, Anime Amigos were born. Anime Amigos are firstly a group of friends, but also a group of neurodiverse individuals and now a group of colleagues. Autism, Dyslexia, Dyspraxia and Irlen’s Syndrome are amongst their neuro differences. Cal, Ren, Reece and Elliot come together to share their Anime interest and expertise with one another. Through monthly online vlogs, and other activities, they aim to connect with other individuals who share their affinity for Anime. Together they have helped innovate the service at Axia, and have supported the connections between autistic individuals, families and the service they come to access. Anime Amigos are committed to their bonds with one another. They are committed to engaging with, critiquing, sharing and inviting knowledge and views on Anime. They aim to facilitate engagement with autistic individuals (and others) who have a shared love of Anime. They meet monthly to create vlogs about Anime which are published on YouTube and Axia’s website and Facebook page. They have connected and worked with Agony Autie; a well-known Vlogger/Facebook presence who shares her experiences of being on the spectrum. Cal is writing a book entitled ‘The Nerd Consultant’s Guide to Anime’ to support newcomers to better understand Anime, as well as the friends/family of those with this special interest. They have decorated an Axia clinic room in all things Anime, which has had encouraging feedback from children and adults alike, with this shared affinity. Clinicians at Axia seek ‘Nerd Consultancy’ from Anime Amigos, facilitating their ability to connect with service users about Anime and other special interests such as gaming. The group seek feedback and ideas at Axia’s monthly Autism Post-Diagnostic Support Group. Members of the group have begun an “Open Room” initiative – laid-back activity afternoons where people who have accessed Axia can hang out, discuss Anime and play various games. This offers an informal, creative form of post-diagnostic support centred around special interests and building connections. Anyone living or working alongside people with autism must be committed to connecting with and nurturing their affinities. Anime Amigos have championed this within Axia-ASD Ltd and the group has been fully embedded into the service. The accounts from the Anime Amigos and Linda Buchan above, highlight the value of the group for the Amigos themselves, clinicians within the service, and individuals who access it. This exemplar of creativity, partnership and celebrating interests within a specialist autism service has shown clear benefits for social connection, providing meaningful activity, feeling valued and heard, and upskilling clinicians on this specialist interest, which fosters engagement with service users. There are some interesting points raised about why Anime can be attractive and beneficial for some people with autism, and how a coproduced group based on a shared passion can have multiple benefits for a range of stakeholders in services. Miller, E. (2008). The girl who spoke with pictures: Autism through art. London: Jessica Kingsley Publishers. Lovely to hear the Amine Amigos direct connection between themselves and their passion. I hope this article will excite other services to consider something similar.